Phillips 66® X/C Aviation Oil is an ashless dispersant, multigrade engine oil specially formulated for year-round use in aircraft piston engines. It provides distinct performance benefits compared with single-grade engine oils, including easier starting and faster oil circulation at low temperatures, reduced warm-up time, and reduced oil consumption in most engines. It maintains its film strength under high loads and at high temperatures to protect against wear and piston scuffing. 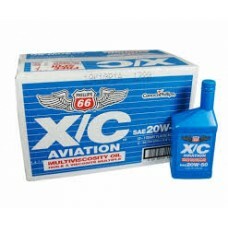 Applications X/C 20W-50 Aviation Oil is recommended for use in opposed piston engines. It can replace Commercial Grade 65, 80 or 100 single-grade engine oils with no sacrifice in performance.